Hoverboards, which are lacking an independent safety certification or basically all that were sold thus far in the United States, pose imminent hazard and are subject now to seizure or recall by the government of the United States, according to a Consumer Products Safety Commission letter sent to manufacturers, hoverboard dealers and importers. The agency said that anyone who is caught selling hoverboards that are uncertified will face both criminal and civil penalties. The governmental agency wrote that the self-balancing scooters did not meet the voluntary standards of safety and pose on an unreasonable risk of a fire to the consumer. 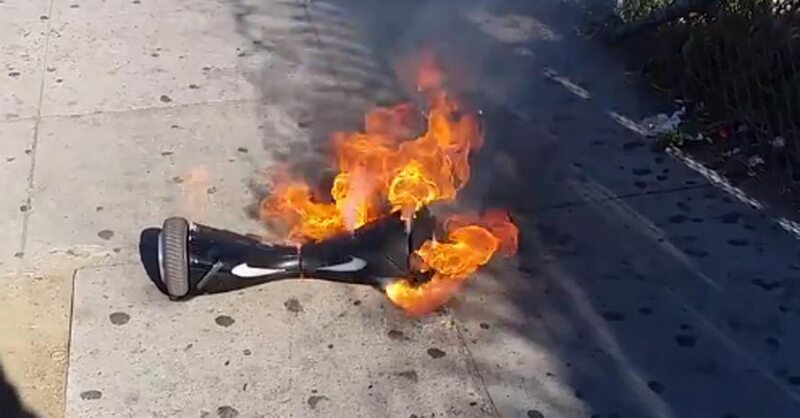 It added that consumers risk potential serious injury and even death if their scooters ignite or burn. The CPSC says that it received over 50 reports of fire that was the result of bad malfunction of the hoverboards from more than 24 states that have caused more than $2 million in damaged along with the destruction of one entire home and an auto. To prevent any future carnage related to hoverboards, the agency has called for the removal of every hoverboards that does not meet the safety standards, and for every importer, manufacturer and seller of hoverboards to acquire an independent certification for safety. CPSC officials added in their letter that they are of the belief that many of the incidents reported and the related risk of injury and possible death associated with fire that ignites in the products, could be prevented if all of the said products were made in compliance with the referenced safety standards. The agency along with its letter shared a disturbing video of its testing process for the hoverboard. Essentially the hoverboard dealers have been ordered to receive two separate levels for safety certification. One is for the lithium ion batteries that are outlined by the U.S. Transportation Department and the United Nations. The other is for the entire unit by the Underwriters Laboratory, which is a private company that is known for the certifying of safety for a myriad of everyday products. UL announced earlier in February that it started accepting submissions from makers and distributors of hoverboards. To date, those who have purchased hoverboards had to take the companies selling them at their word that the product was safe. As the hoverboards grew in its popularity, the CPSC released a number of statements that emphasized the concern it had about fire reports, but held off on making crackdown on manufacturers, of whom most reside in China.